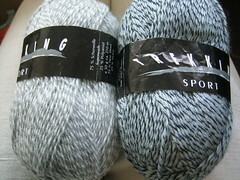 Slightly more than two years ago, I set up a Yahoo group called The Six Sox Knitalong. 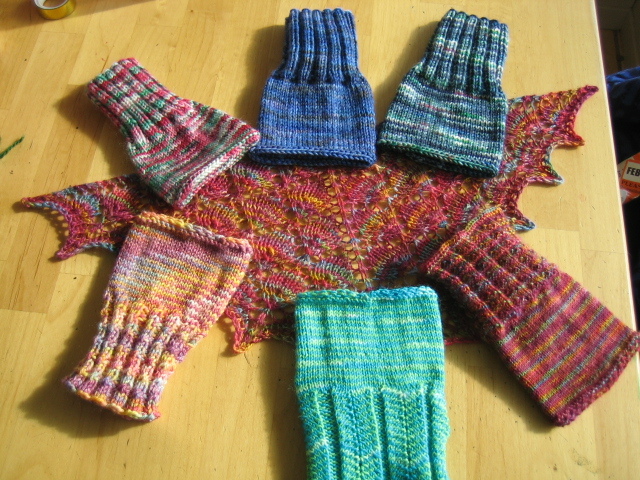 The original premise was a year-long knitalong in which members knit six different sock patterns together as a group over the course of the year, beginning June 1st. 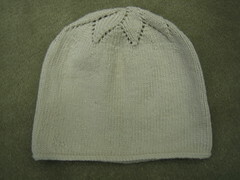 The patterns were written by group members and not available elsewhere until the end of the two-month knitting period. There was a raffle for those members who knit each individual pattern and posted both a progress photo and a finished photo. There was also a final raffle with lots of wonderful prizes for those members (and there were quite a few) who knit all six socks and posted the requisite photos. 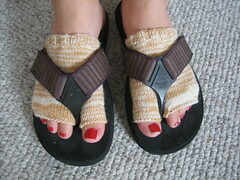 The raffles proved to be excellent motivators and most members who knit the socks uploaded the photos. It was amazing to see each knitter's interpretation of the pattern and the differences in the finished socks based solely on the yarns chosen. After the first year, members indicated they'd like to continue the group so I managed to coax 6 more patterns from 6 more designers and the second year was underway. Because the designers were not compensated in any way, their contributions represented an amazing gift to the knitting community. And, we continued the individual raffles because generous members donated either money or yarn for prizes. I remember being shocked when membership in the group totaled 250 after the first few weeks. As of yesterday, it was approaching 3,000. The group would have ended a long time ago if I hadn't had the technical and, at times moral, support of Beth and Jane. Thanks, grrls! Why am I telling you this? Because tonight I am bowing out of the day-to-day micromanagement of the Six Sox Knitalong and turning the reins over to someone else. Managing a list of 3,000 members has become too time-consuming and hasn't left me with much time to knit after factoring in the full-time job, the two kids and, of course, the blog. And although it has become a burden that I just can't bear any longer, I would liken giving it up to watching your child go off to school on the first day. You know, not quite trusting someone else to take care of your baby the way you took care of her. I'm easing out without any fanfare, but something happened on the list yesterday that I wanted to share. 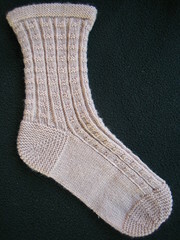 Since April 1st, the members of the group have been knitting a sock pattern I designed. 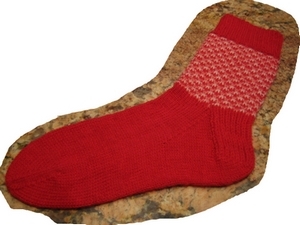 In conjunction with the adult version of the pattern, I also designed a child-size sock and established a second raffle for members who knit the child-size socks and donated them to Children In Common, one of my favorite charities. 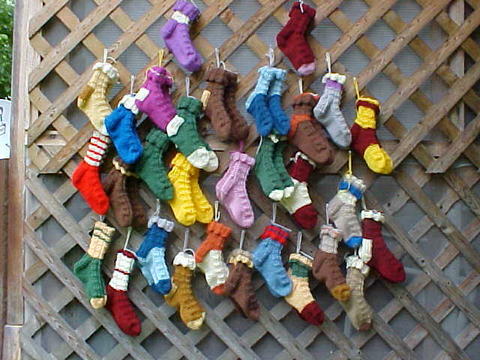 Yesterday a member of the list, Sue, posted a photo of 30 pairs of toddler socks she knit for CIC from my child-size pattern. Yes, that's not a misprint, 30 PAIRS. After much angst over my decision to let my creation go, I now I feel like I'm ending on a high note. While I was preparing my "K" post for the ABC-Along, I realized that I never posted my "I" and "J" entries. Doh! 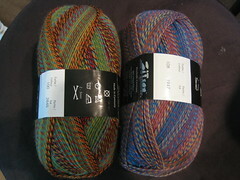 In keeping with the theme I established at the beginning, here are two yarns from my stash. I is for . . . . 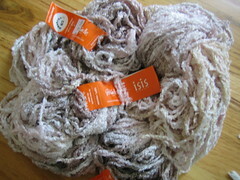 I typically avoid novelty yarns and chenilles; Isis is a rayon chenille novelty yarn. So why do I own three skeins of it? Because it is absolutely dreamy. What will I make from it? I have no idea. I never avoid Jaeger or cashmere. Cashmina is 80% cashmere and 20% merino. It's unbelievably soft and comes in its own cute little plastic case. Gotta love the plastic case. 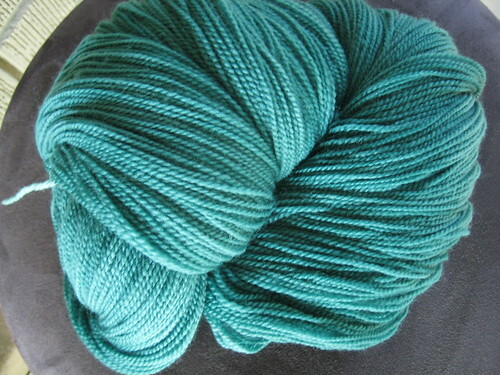 Sadly, I only have this one skein. Enough for a very small lacy scarf or, now that I think of it, some wristwarmers might be nice. So fess up. Did you click on the link from Thursday's post and order the book???? You did, didn't you. 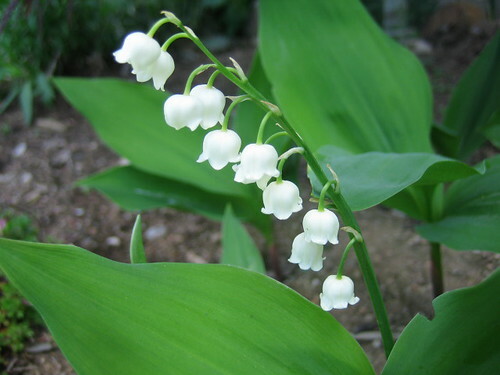 Lilies of the Valley are probably my favorite flowers. When I was a kid, my grandmother lived on the edge of a forested area in Massachusetts (do forested areas still exist in Massachusetts??) and her yard was carpeted with them. I planted several in my front yard a few years ago when we pulled out the yucky junipers. 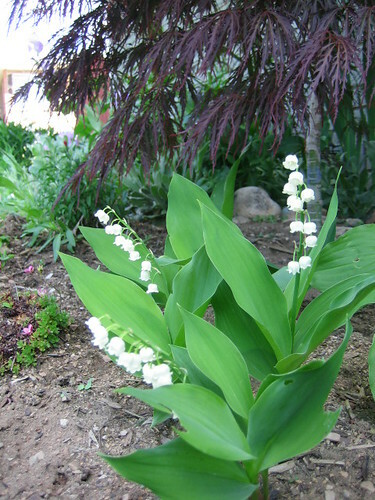 But growing Lilies of the Valley is not quite so easy in the desert as it is in Massachusetts. The plants didn’t die, though, and in fact the foliage was quite nice. But I couldn’t get them to bloom. I’ve been absolutely coveting this book ever since I read an article about it in the Spring 2004 issue of Spin Off magazine. 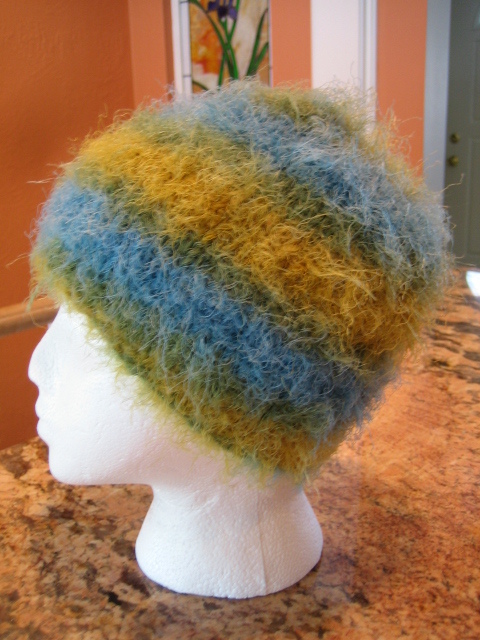 It’s chock full of fabulous patterns for hats, mittens, shawls, and socks . 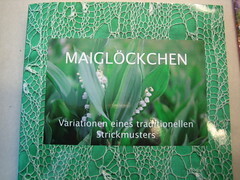 . . all using the Lilies of the Valley stitch pattern. The book is written in German but I can make out quite a bit of it. 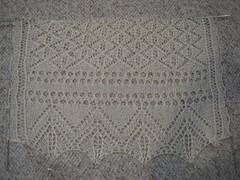 The inspiration for the patterns came from the Lilies of the Valley shawls knit by an amazing Estonian woman named Edith Haller. You can find more information about the book here. But once you read about it, you’ll want one too. I had a bit of leftover yarn from my Sixth Sense socks so I whipped up these cuties for DD to wear with her flip flops. "I think you're running out of things to knit." Ahh, out of the mouths of babes teens. 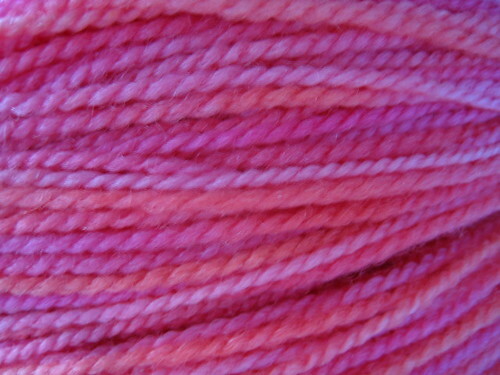 Due to the surprising interest in the the hand-dyed yarn I posted for sale on Sunday night, I'm contemplating dyeing up a few more skeins in the same colorways this weekend. Email me if you'd like to put a "hold" one of the colorways. 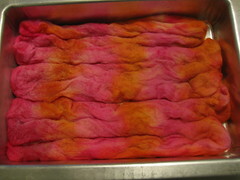 I did a little dyeing over the weekend and I'm offering up my babies creations for sale. I've been experimenting with creating more subtle colorways and these are the best of the bunch. In fact, it's kinda hard to part with them but, dang, I can't keep everything. 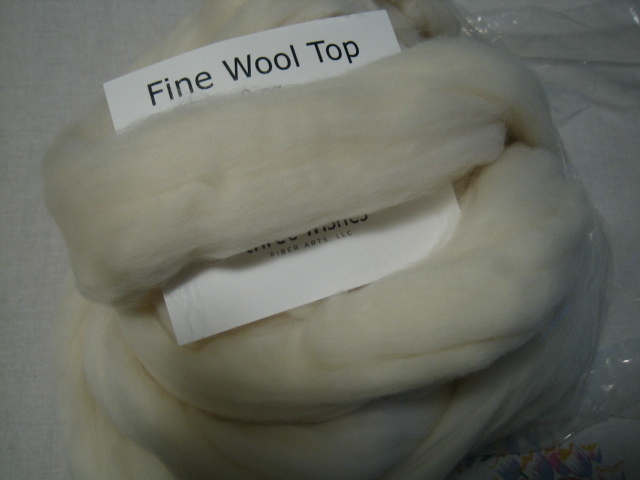 The yarn is a soft, 2-ply, 100% superwash merino wool. 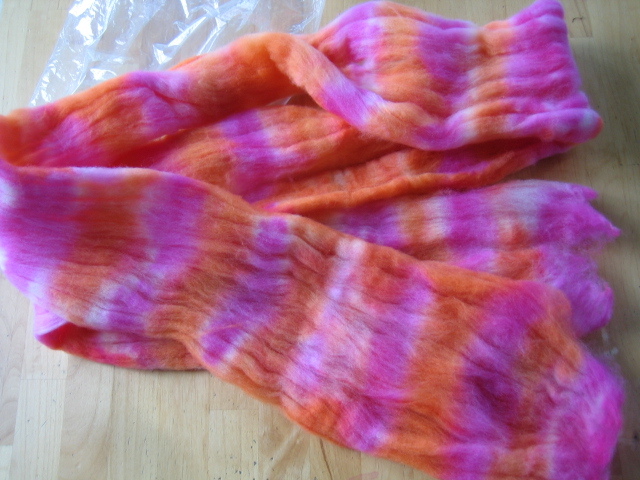 I've dyed it with acid dyes so the colors are washfast and lightfast. For socks, I would recommend a size 2.0 or 2.25mm needle. 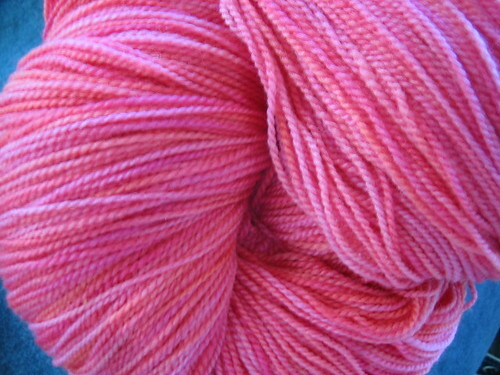 I'm calling the first colorway "Red Sky At Night." 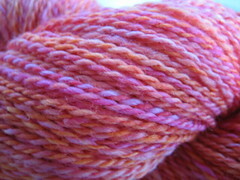 It's a mix of oranges and pinks, nearly identical to this yarn I spun from my hand-dyed roving. 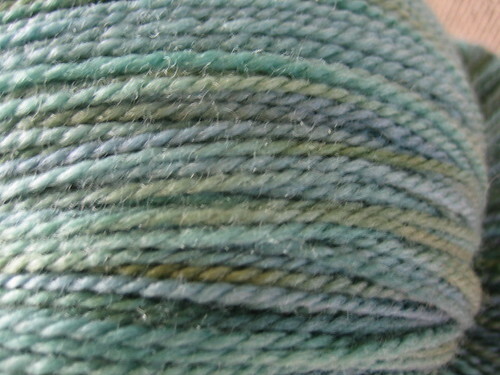 The second colorway is called "Stormy Seas." It's a subtle mix of greens and blue-greens. The third colorway is a gorgeous deep, blue-green (can you tell this is my favorite of the three) which has only the most subtle variegation. 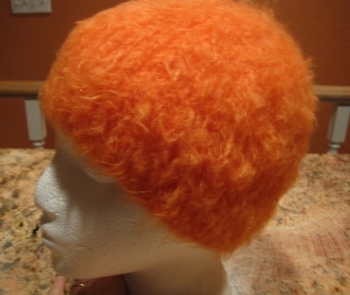 I used two colors of dye and the "very slightly not solid" look was intentional. 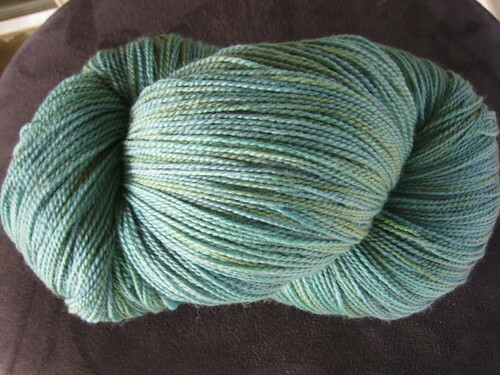 I'm calling this colorway "Tourmaline." Email me if you’re interested. If you want to pay with PayPal, I can only take the cash-funded variety; no cards. The first challenge in The Amazing Lace is to introduce the members of our team. The yarn is a single-ply Icelandic laceweight from Schoolhouse Press. I consider the yarn to be the strong point of my team. Mostly because it's . . . er . . . strong. Seriously. 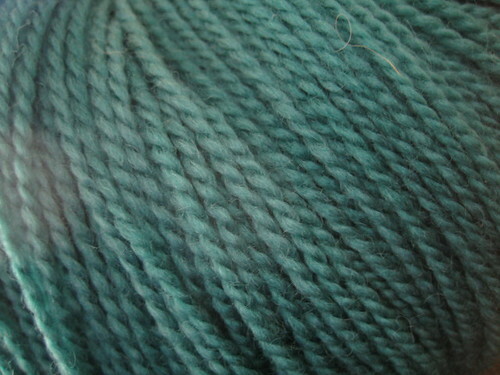 This yarn is like 100% hemp or twine. To compensate for the sticky, scratchy yarn, I asked a pair of my vintage metal circular needles to join the team. They were up for the challenge. Next, there are the two indispensable members of my team; the magnet board and stand. I know in my heart this challenge cannot be won without the stand. Seriously, spending 400+ rows knitting lace (there are no resting rows in my pattern) with my head bend down over a chart was not an appealing scenario. Do you have a magnet board? Buy a stand. Now. Finally, there's the indulgent member of my team. My highlighter tape. This tape was kindly sent to me by blogless Kate in Massachusetts and I adore it. It's particularly helpful if you're like me and carry your lace knitting to work or your child's softball games. The added security of knowing you won't lose your place on the chart even if your magnets reposition themselves on the trip is priceless. Notwithstanding the fact that I haven’t even added the Amazing Lace button to my sidebar yet, I went ahead and signed up for Norma and Margene’s Trek-Along. And from the look of it, the rest of you have signed up too. Yikes, that’s a lot of trekking. Signing up was the easy part. I’m now faced with the daunting task of choosing a colorway, not to mention a pattern. 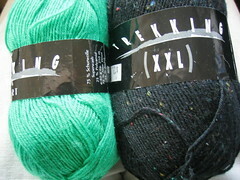 I dug through my stash this morning and pulled out several skeins of Trekking. Which one will make the cut? At first I intended to use colorway #100, but saw that a huge percentage of the participants in the knitalong have already selected that colorway. Can’t be one of the bunch now, can I. At this point I’m leaning toward colorway #07 which is pretty mix of purples and blues and pinks. 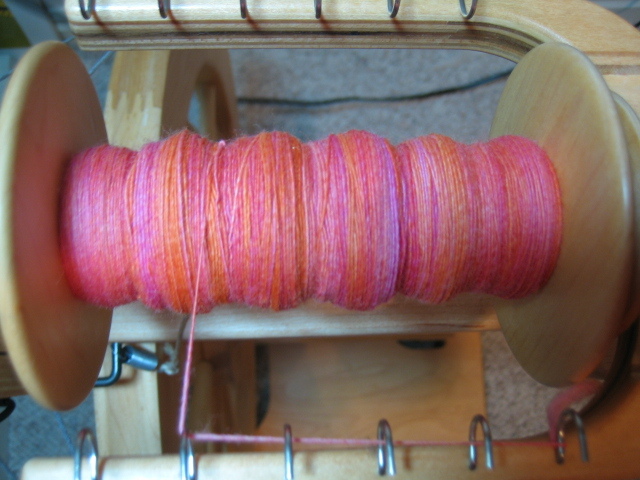 The colors in that skein are kinda muted and "dusty," not the screaming crayon colors I hate. 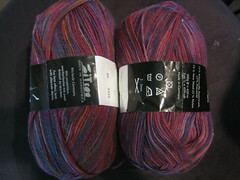 Plus, the skein was a gift from Kadri and I typically knit up gifted skeins before ones I purchase myself. As much as I love to buy yarn, it’s much more fun to knit with yarn that’s been received as a gift. In between stints at addressing 150 Bat Mitzvah invitations and attending a lovely Mother's Day brunch at my favorite restaurant, I managed to complete several repeats of the center panel of my Langsjal Jóhönnu. It was slow going at first. I was having a difficult time reprogramming my brain to read the chart from both the right-to-left on the right side rows and left-to-right on the wrong side rows. But I'm in the groove now and it's moving fairly quickly. Interestingly, I have used nearly an entire, 50g ball of the Icelandic yarn and the stole measures about 17 inches long, measured from the tip of the border points. I'm shooting for a finished length of approximately 68 inches so I'm about a quarter of the way finished. 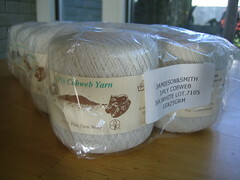 By my estimate, I'll need 4 skeins of yarn or about 1,000 yards. That's double the yardage called for in the pattern. Of course, I'm knitting mine at a much larger gauge and I'm fairly certain my yarn is heavier than the yarn used for the original, sample stole. 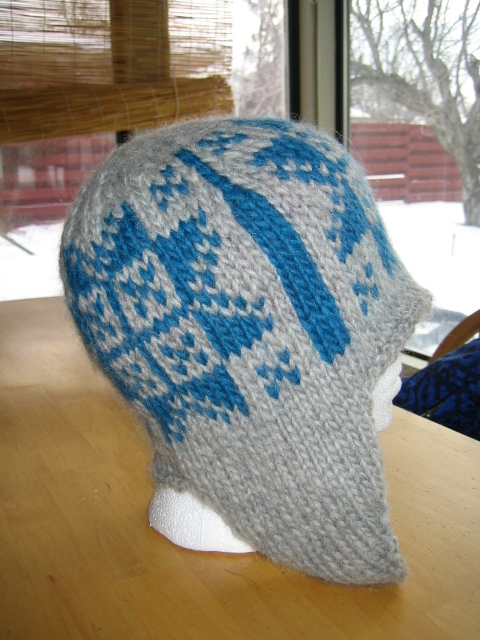 The pattern indicates that stole was made from "handspun wool." But, then again, I've made several of the shawls in the Three Cornered and Long Shawls book and each has taken more yarn than suggested. So tuck that thought away. Completely disregarding Sylvia’s insightful comment that the shawl she made from the Icelandic laceweight yarn feels like "a cloak of fire ants," I decided on the Icelandic for my Langsjal Johonnu. The yarn was gifted to me by DH, who also bought me the Three Cornered and Long Shawls book, and it’s been waiting in the stash for a while now. So, the die is cast. To counter some of the scratchiness (which I don’t deny), I decided to use a much larger needle size than the one called for in the pattern. 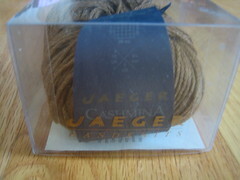 After working up several swatches, I decided on a 5mm (U.S. size 8) needle. 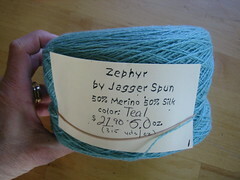 I also chose a metal needle after reading Sylvia’s remark that the yarn was very "grabby." 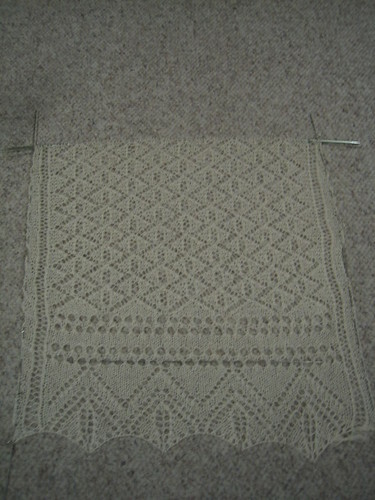 Based on the size of my swatch, I also decided to alter the pattern by eliminating two repeats of the border pattern. 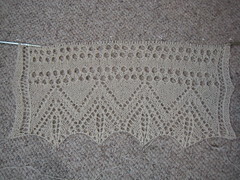 Accordingly, I cast on 92 stitches instead of the 130 called for in the pattern. My tentative measurements indicate the finished stole will be about 24 inches wide. That’s only 1 inch narrower than the finished dimensions of the stole in the pattern book, which has two additional repeats. Go figure. My initial reaction to the yarn . . . Yes, it’s slightly scratchy but I’m really enjoying knitting with it. I think it was wise to use a large needle. Another observation about the yarn . . . there is no way I would characterize this as laceweight. Each 50g skein has only 250 yards of yarn and with the large, 5mm needle, I am getting a nice, open lace that’s decidedly not sloppy. I can’t even imagine knitting this at a gauge tighter than the one I’m using. The garment would have the attributes of a suit of armor. I’m off to start the center panel . . . . . . . I forgot to mention it, but I recently joined the Amazing Lace Knitalong. I should probably add the button to my sidebar, huh. I’ve been grappling with choosing my teammate and basically waffling between the Forest Path Stole by Faina Letoutchaia from the Summer 2003 issue of Interweave Knits or the Langsjal Jóhönnu from the book, Three Cornered and Long Shawls by Sigridur Halldórsdóttir. 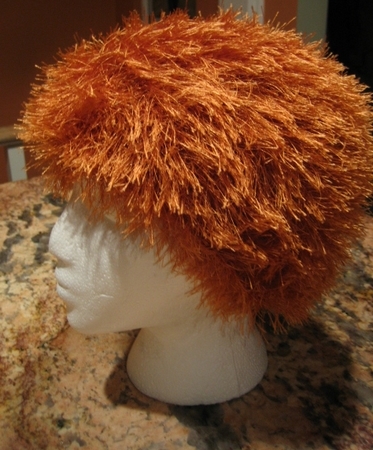 After reading today that Margene is considering the Langsjal Jóhönnu, too, my choice was made. 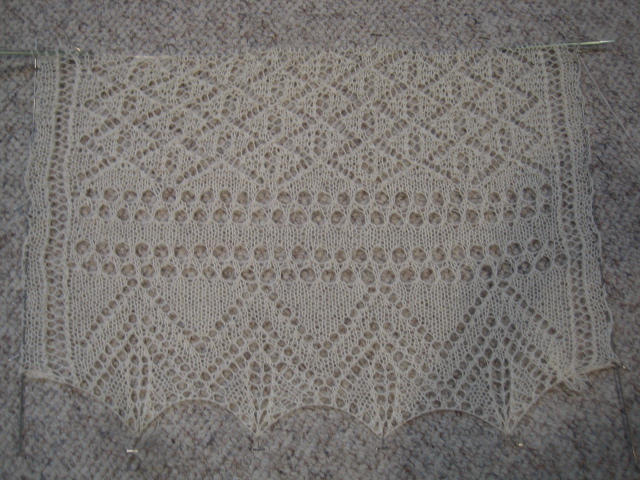 When I first looked through the translation of Three Cornered and Long Shawls, I read that the Langsjal Jóhönnu is the most intricate design in the book. 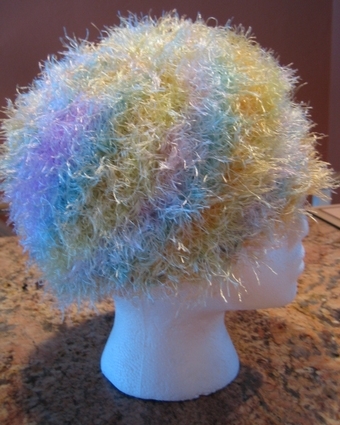 Of course, I decided right then and there that I’d have to knit it. But obligations and other projects intervened so I never cast on. But now I have incentive since Margene and I are planning to keep an eye on each other during the knitting. What do you think? 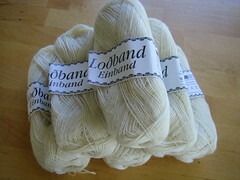 Icelandic laceweight or J&S cobweb or Zephyr?? My hand-dyed roving is . . . 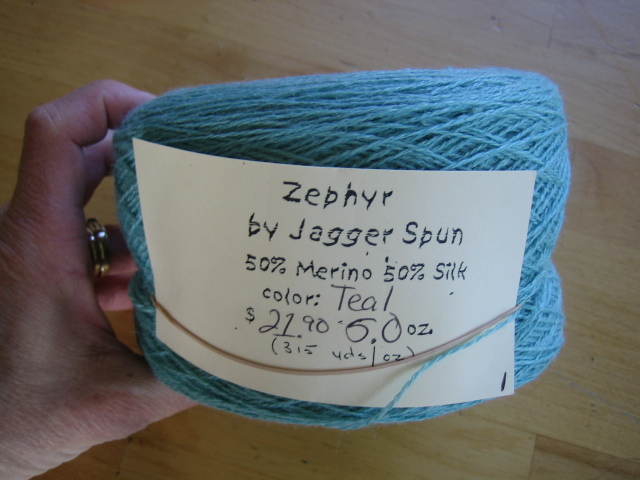 I got 270 yards of yarn from the 2.8 ounces of roving. Now I just have to decide what to make. Lacy ankle socks might be nice for summer. This pattern is dedicated to Mr. Etherknitter. 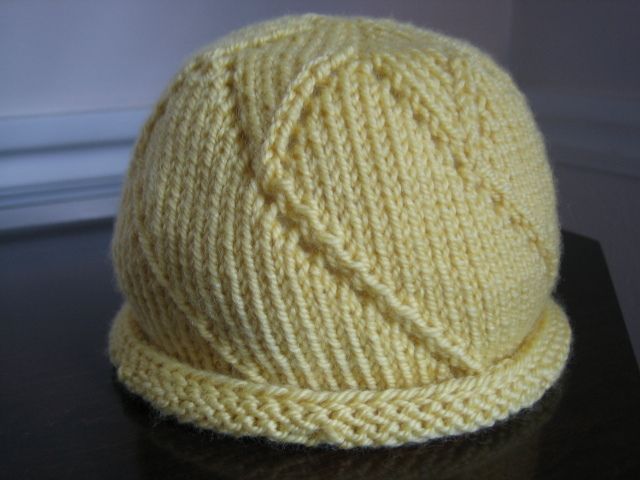 Note on Sizing: If you use U.S. size 4 needles (3.5mm) to obtain a gauge of 6 stitches per inch and otherwise follow the pattern exactly as written, the finished hat will fit a preemie or newborn. Cast 7 stitches onto one of the dpns. Distribute the stitches over 3 of the dpns (or 4 dpns if you are using a set with 5 needles) and join into the round, being careful not to twist the stitches. 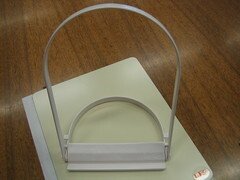 Place a marker to indicate the beginning of the round. Work the star pattern on the crown of the hat by following the instructions for Rnds 1-22, below. When you have a sufficient number of stitches, transfer them to the circular needle. You should now have 84 stitches. Make sure the beginning of the rnd is marked. Rnd 1: k11, yo, ssk, *k10, yo, ssk; repeat from * to end of rnd. 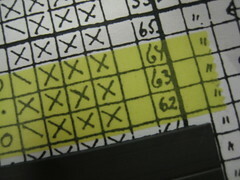 Note: At the end of the rnd, it will be necessary to move the marker one stitch to the left to complete the ssk decrease. In other words, the beginning of the rnd will shift by one stitch each time you work Rnd 1. Repeat Rnds 1 & 2 until the sides of the hat are approximately 3 inches long. End by working Rnd 2. Bind off using an applied I-cord following the steps described below. 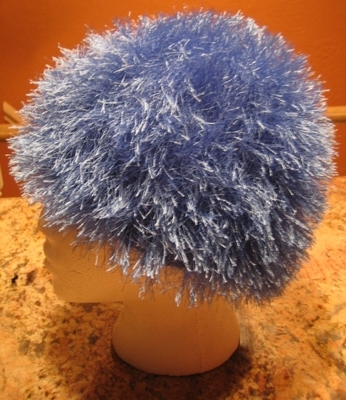 Note: The sides of this hat are stretchy because of the lace pattern. In order to insure the bind off is not too tight, you will probably find it necessary to work the I-cord bind off with a needle one size larger. Repeat steps 2 & 3 until you've bound off all the sts from the body of the hat. Bind off the remaining 3 sts and tidy up the join. Weave in any loose ends. 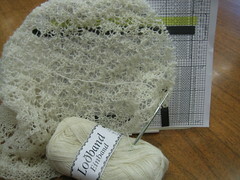 Block lightly to stop the bottom edge from rolling and to open up the lace slightly. 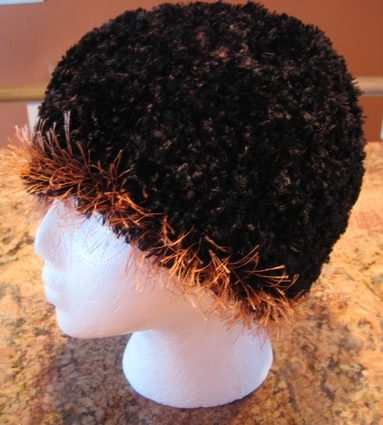 Or leave the hat unblocked and allow the bottom edge to curl. This pattern is for your personal, non-commercial use only. You may not reproduce the pattern for distribution, sale, or any other purpose. Finished items made from this pattern may be donated to charity but they may not be sold under any circumstances. The lighting is pretty horrible in that second photo. The colors are medium pink and dark orange, although the orange is not as brown/rust as it appears in the photo. I dyed this roving using the oven method described by Amy. It’s cooling right now and then I have to rinse it, spin out the extra water, and let it dry. As much as I’d love to poke and prod at it to see what it looks like underneath, I’m going to be strong and leave it until it’s fully cool (yeah, right). And for those of you interested, I worked up the crown of the star hat from yesterday's post and my intuition was correct; well, to a point. The pattern works out, but you end up with 84 stitches when you're done increasing, not 77. 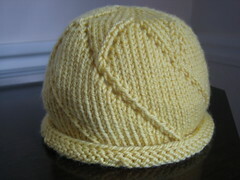 Which means, of course, that I chose the wrong yarn and needles for a baby size hat. 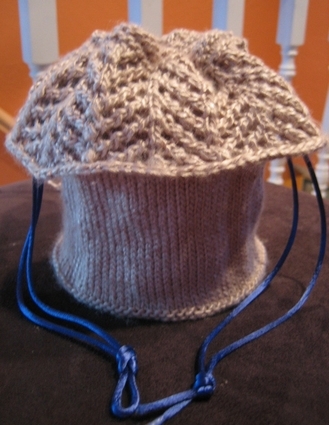 The hat I have on the needles now, is much too large at 84 stitches. 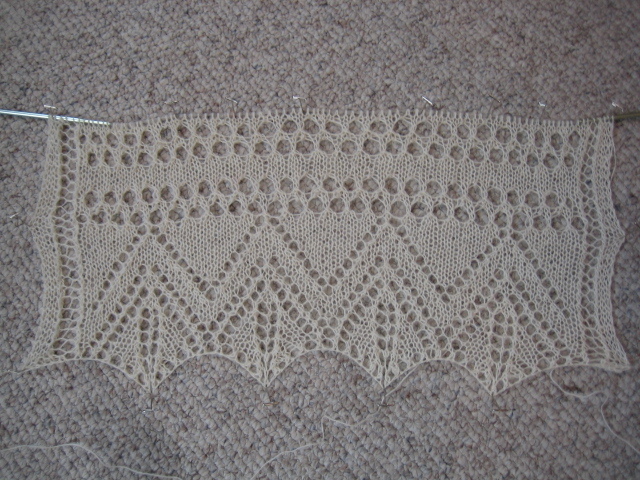 But I did use this first attempt to work out a great way to knit the sides. 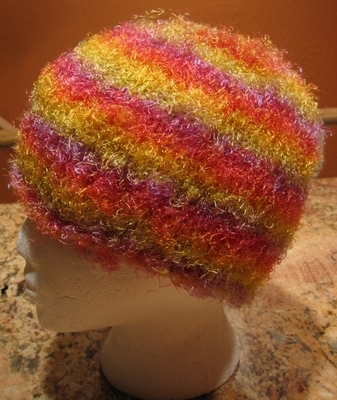 I’ll try and write up the full pattern this weekend and post it on Monday. Quite a few people wrote and asked for the pattern but I’d only written some cryptic notes that I never had a chance to decipher. 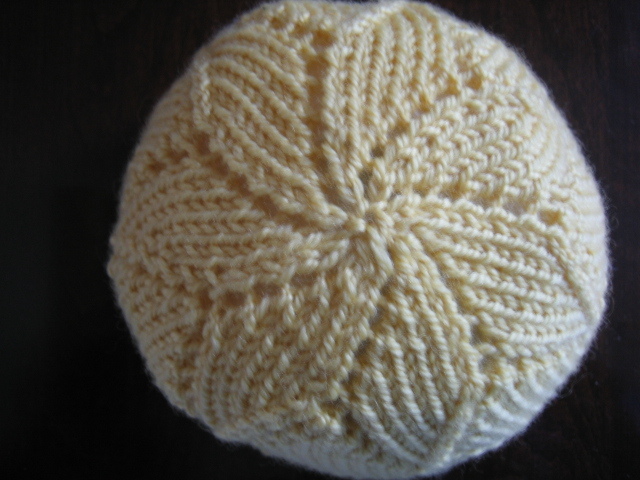 Well, there’s been a sudden onslaught of babies in my social circle and I’m thinking a baby version of the star hat might be in my knitting future. Unfortunately, I have to start from scratch since I can’t even find the notes now. I originally got the idea for the hat when I was browsing some old doily patterns I found on the Web. Although I bookmarked the page, it appears the site has now been deleted. 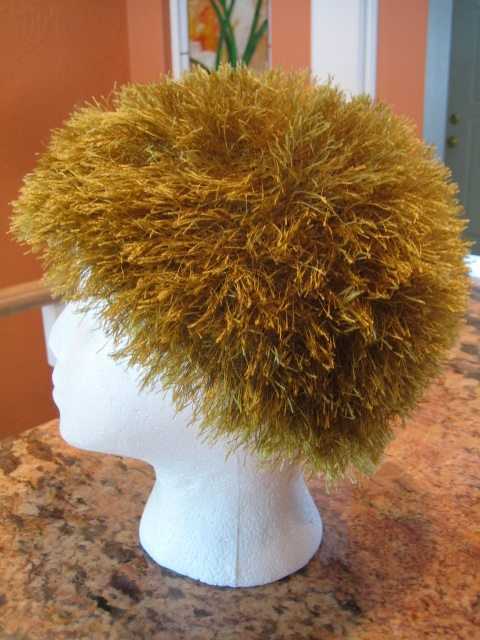 So yesterday I used the "Way Back Machine" to find this archived copy of the pattern upon which I based the hat crown. There's a photo of the doily here. I should have 77 stitches at this point. 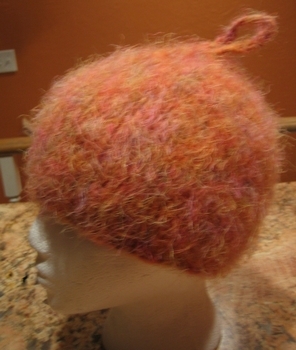 For a hat with a 16 inch circumference, it looks like I'll need to choose a yarn that gives me about 5 stitches to the inch. I guess I can always increase or decrease a few stitches to get where I need to be. OK, I’m off to see if this works. Feel free to try it, too. I'll post my progress on Monday and then worry about working out the sides. Now here's a method of dyeing roving that I've never seen before. Follow this link if you can't read French. And let us know if you try this. I'm so curious about it.